Golf • Cart • Lunch • Beverages and Contests are all included in your entry fees. The United Way golf outing began 25 years ago with an invitation by Meadowview Golf Course. 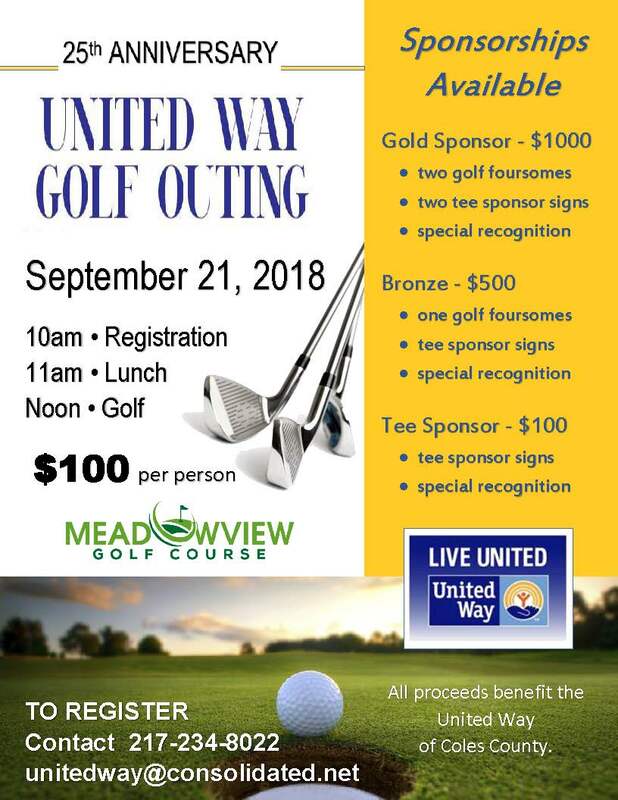 Due to the generosity of Meadowview, which donates all of its services, all proceeds from outings benefit the United Way. So while you are having fun, your fees for the outing provide PEOPLE in Coles County with food and shelter, or provide respite weekends for families with a disabled loved one or send that loved one to summer camp. The fees help senior citizens buy medicine they could not afford on their own, or are used to purchase clothing and school supplies for children in need. United Way provides funding to 30 local non-profits which allows your contribution to be part of a combined response to many local needs. The impact of United Way is wide, it touches nearly every single person in Coles County and it is diverse, providing emergency assistance, life building skills and encouragement. We thank you in advance for supporting such a great cause! Please use our ONLINE BOOKING BUTTONS for fast and simple Tee Time Reservations!